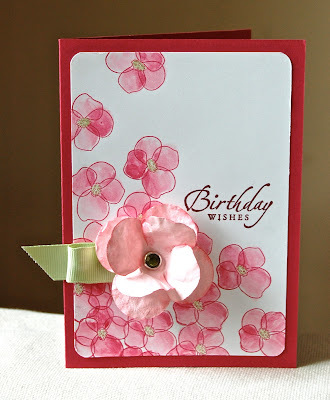 Stampin' Up ideas and supplies from Vicky at Crafting Clare's Paper Moments: Growing Green birthday card - and my new flower tutorial! Growing Green birthday card - and my new flower tutorial! The stamped background is made with the utterly stunning Growing Green stamp set. I've been in heaven stamping the beautiful designs onto watercolour paper, and happily colouring them with my aqua painter, but I did wonder what would happen if I used everyday Whisper White card stock. So I tried it and this happened! Perfectly acceptable! But have you seen the flower? Normally I'd recommend turning the punch upside down so that you can see what you're cutting but because this extra large punch embosses as it cuts, it needs a stable surface to punch on. Pop your card stock in the punch (I've used Pink Pirouette) and use the heel of your hand as shown. Now you can start smoothing out the card stock with your thumb nail. This carries on the job of breaking down the fibres in the card stock and makes it quite soft and malleable. Use paper snips to separate each petal. Can you see the shape emerging? Take a sponge dauber and sponge the edges of the petals with Regal Rose ink. Gently peel apart the card stock so you end up with layered petals and sponge those edges too. Punch a hole in the centre of your flower and decorate it with a rhinestone brad - this large green one from the Circle Ice collection is a real favourite of mine. Now the flower is ready to embellish your card. And there we have it! The four-petalled flower. If you decide to have a go at this, do let me know - I always love seeing your projects! Just click here to email me. Thanks for dropping in today. I hope you have a fabulous weekend. Wow, this is awesome Vicky! Great visual tutorial, and thanks for sharing. Your card, as always, is spectacular! Just finished perusing your blog and have found so many great ideas! Since most of my stamps are SU sets, I look forward to seeing how you use them. Thanks for stopping in at my blog. Loving this card soooo much and what a great idea for the flower!!! Such a pretty card - love the flower. Great tutorial too! So pretty Vicky. I love you created the flower. Very inventive! Very pretty. TFS the flower tutorial, it's wonderful !! What beautiful stamping and watercoloring! And that flower is gorgeous! Thanks for the tutorial. Beautiful card Vicky. Love this 3D flower, thanks for sharing! Gorgeous flowers, loving the effect and a great card. That is fantastic! I don't have that punch, but I'll be adding it to my next order! The flowers on the card are gorgeous and your paper flower on top finishes it perfectly. You are so clever, Vicky! Thanks for sharing your flower method. The card is gorgeous! This is such a beautiful flower on a gorgeous card. TFS.